By focusing his work on the analysis of the major religions of the world’s nation states–Christianity, Judaism, Islam, Hinduism, and Buddhism–Max Weber was able to rely on the common understandings of his audience and bypass the question of how religion should be defined. This question which has been more pressing to anthropologists who worked with a broad range of less well-known nonwestern religions than sociologists of Weber’s day were concerned with. In Gessamelte Aufsaetze zur Religionssoziologie, which Weber worked on from 1911 until his death in 1920, Weber drew upon the vocabulary of his day, contrasting belief in the “supernatural” and in “spirits” with “naturalism” and the “this-worldly orientation” of religious goals. But he simply used such terms as practical tools for examining his real interest, the structure of religion and religious processes and sidestepped the question of defining religion, beginning his treatise with these words: “To define ‘religion,’ to say what it is, is not possible at the start of a presentation such as this. Definition can be attempted, if at all, only at the conclusion of the study. The essence of religion is not even our concern, as we make it our task to study the conditions and effects of a particular type of social behavior” (1922:1). Instead of attempting to define religion, Weber merely relied on his audience’s common understandings and used the established vocabulary of his day, he cast new light onto the structure of religion and onto religious processes. Since the time of Max Weber, there have been changes in the vocabulary on which sociologists and anthropologists draw to discuss religion. We speak, for instance, of revitalization processes and mazeway resynthesis, terms popularized after the work of Weber. With the passage of time and the rise of new and different idioms, it is all too easy for those of a new generation to wrongly assume that our perceptions differ qualitatively from those of our predecessors. I wish to demonstrate how versatile the insights of Weber remain after three-quarters of a a century by applying his views of religion and religious change to an examination of a recent schismatic movement within the Mormon religious tradition. The most prominent weakness in Weber’s work was that he approached religious change consistently in terms of sudden, qualitative shifts–what he termed “breaks”–in religious traditions and world-views. This was a natural outgrowth of his use of the evolutionary framework which had been popularized by anthropologists in the previous century. However, this is not, in my opinion, an inherent weakness of Weber’s conceptual scheme but merely a limit in how Weber applied that scheme. I hope to demonstrate that Weber’s tools may be applied to the more gradual changes which occur within religious traditions by applying them to an examination of change within the Mormon variant of the Christian tradition. Mormonism offers very fertile ground for the study of religious change and of what Weber termed “charismatic prophets”. In its century and a half history, over two hundred schismatic groups guided by leaders who lay claim to divine inspiration have arisen within the Mormon community. One of the most recent of these new offshoots was formally organized on May 3, 1994, in Manti, Utah, as the True and Living Church of Jesus Christ of Saints of the Last Days (TLC). The central legitimizing characteristic of the TLC is a return to what it holds to be the pristine teachings and practices of Mormonism’s original founding Prophet, Joseph Smith Jr. 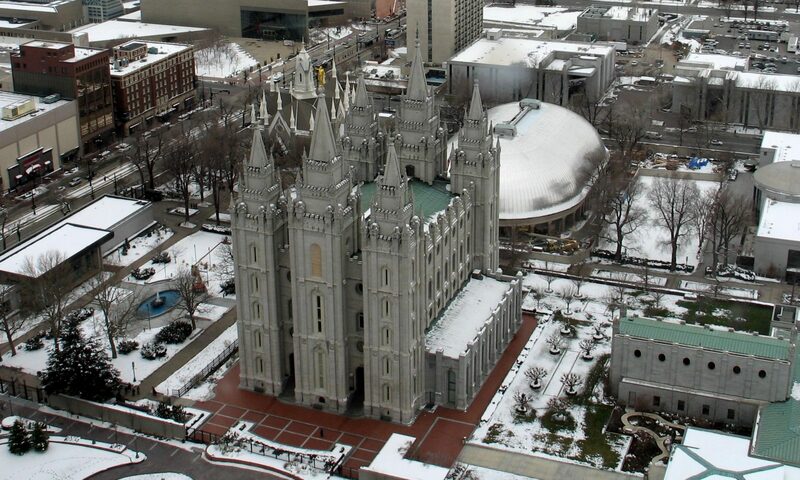 Led by its Prophet, Jim Harmston, and a Quorum of Twelve Apostles, the TLC has reinstituted the practice of polygamy and a communal economic order and teaches that the LDS Church, headquartered in Salt Lake City, Utah, has been in complete apostasy since its extension of the priesthood to Blacks in 1978. Distinctive doctrines of the TLC include a reinstatement of the so-called Adam-God doctrine, the belief that God the Father took on mortality and became Adam, the Father of the human race, a belief which has been rejected by the LDS Church in this century. The TLC also asserts that Joseph Smith Jr., the founding Prophet of Mormonism, has been resurrected and is actively involved in organizing the TLC and reestablishing the original doctrines of Mormonism. Members of the TLC emphasize the role of personal religious experiences such as visions, visionary dreams, the visitation of angels, and the everyday experience of miracles by members at large. Like many previous Mormon schismatic movements, the TLC embodies a move towards a more charismatic leadership structure that is more conducive to active ecstatic religious experiences among congregation members than is the more bureaucratized form of ecclesiastical authority currently practiced by the LDS church. As such, it presents an excellent opportunity to examine the dynamics of such a transformation in Weberian terms. Though Weber’s vocabulary did not include the phrase “revitalization movement” which has been popularized since Weber, his conceptualization of religious change captures the process quite well and casts a light on how the structure of a religious ideology and social system can be important elements in the mechanisms of change. Both LDS Mormonism and TLC were founded by “prophets” in Weber’s sense–charismatic leaders who formulated new systems of ideas for “rationalizing” life experience, that is new ways for believers to conceptualize the social order of which they are a part and the cosmic and moral orders that give it broader meaning. In both cases–the original founding of Mormonism and the recent origin of TLC–the prophets announced what Weber termed “breaks” with the established normative order and declared this break to be morally legitimate by invoking a divine source of authority. Weber’s system also lacked the term “alienation”, but he nevertheless made it clear that there is a relationship between religious innovation and psychological reactions to socio-structural stresses. In his view, different social conditions result in different “sensitivities” to the same stimulus to “break” with the established order. The prophet-founder of a new religious movement is an individual whose experience within his social structure has confronted him with problems in need of solving, problems that make him aware of the contrasting options of changing the established social order or supporting it and who finds the option of change the more attractive one. He and his followers are less likely than other members of society to have a vested interest in the status quo. This aptly describes the economic circumstances of the current followers of the TLC, whose occupations are, for the most part, within the middle to lower middle economic strata and who currently reside in a rural environment that offers little opportunity for employment. Many have been unable to find the type of employment for which they were trained. In these circumstances, TLC members tend to be strongly conservative, even reactionary in their political views and perceive their economic difficulties to be the result of social policies which in recent decades have in their view favored less qualified minorities at their expense. They therefore oppose such programs as Affirmative Action and idealize the gender roles of the late 1940s. Their corresponding religious views are a rejection of the perceived accommodation of the LDS Church to these modern “liberal” values, as exemplified by the LDS rejection of polygynous marriage earlier in this century, recent changes in LDS temple-marriage vows (which no longer include a covenant by the bride to “obey” her husband) and the extension of the LDS priesthood to Blacks. As a religious community, they home-school their own children and share economic assets with one another. Some members practice polygynous marriages. The founders of both the LDS Church and the TLC are “ethical prophets” in Weber’s terms, charismatic leaders who are not just role models that others may choose to follow to achieve a higher level of personal virtue, but leaders who proclaimed a duty for others to follow their precepts. Since these precepts include the entitlement of all members to direct guidance from the Holy Ghost, there is a tension within the structure of the Mormon religious tradition, a tension between the personal spiritual experience of individual members and the policies of leaders whose authority is, by definition, divinely sanctioned. The LDS church has grown rapidly since its inception and today numbers over 9 million members. With this growth, the charisma of leadership and the ecstatic experience of members have been replaced by routine and bureaucracy. Yet the Mormon tradition legitimizes the direct involvement of the Spirit in the lives of individual members and in the role of Church leaders as the mouthpieces of God. The discrepancy between practice and theory remains a constant basis for “breaks” with the current system of Church authority by new charismatic leaders who offer a return to the early, more Pentecostal pattern of ecstatic religious experience in both leaders and members alike. Nevertheless, schismatic movements within the Mormon tradition maintain the essential ingredient of tension at its core: the tension inherent in the the religious autonomy of the individual that is implicit in ecstatic religious experience and the obligation of obedience to leaders implicit in the concept of their status as prophets. Thus, in its short history, the TLC has already experienced its own schisms, which like those of the LDS church have arisen out of conflicting views concerning the relative authority of their prophet leaders versus the claim to inspiration to which other members are also entitled in the Mormon theological tradition. For instance, the largest split within the TLC developed when the leadership formulated a taboo against plural wives sharing the same bed with their husband. Some members viewed the imposition of such rules as an inappropriate use of authority by the church’s leaders. Thus even in the face of the important theological innovations involved in a revitalization process, the tension between two competing sources for the legitimation of religious knowledge has been perpetuated within the TLC as well as within the LDS mother church. And this tension has continued to generate new prophet leaders who “break” with their group’s current religious worldview when its system of rationalization is out of harmony with their own circumstances. This pattern is a consistent element of schisms within the Mormon tradition and goes a long way toward explaining the large number of schisms in Mormonism’s short history. By focusing on the effects of a social organization and its system for understanding human experience on the psychology of its constituents, Weber’s approach to religion can be used to highlight ways in which tensions within a particular worldview can condition the nature of religious change, perpetuating continuity by maintaining the structure which perpetuates those tensions, even while making a major “break” with the prior religious tradition. Though Weber’s vocabulary differed from later students of religious change, it was certainly adequate for discussing schismatic changes and revitalization processes in religious tradition.